A new special-edition collection from Essence, available in stores at Ulta! I'm not a fan of anything Twilight related, but I do think the collection has quite a few nice nail polishes and pigments at affordable prices. 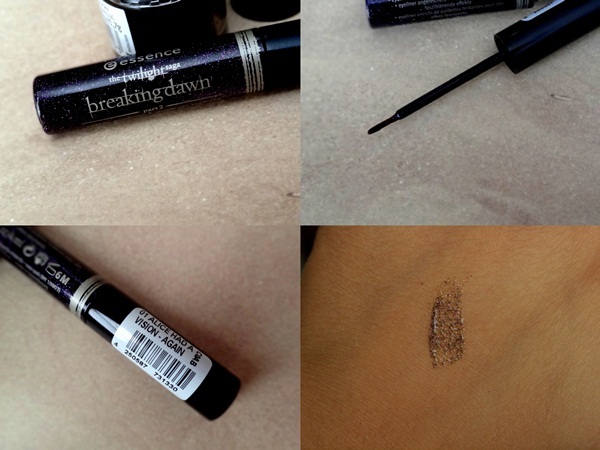 Products featured here are Liquid Glitter Eyeliner ($2.99), Loose Pigments Eye Shadow ($3.49) and Lipstick ($2.99). Essence is a good drugstore brand as far as quality goes, but this time around I was a little underwhelmed by their glitter eyeliner and lipstick. The Lipstick isn't extremely pigmented, but it works fine as a layering shade and does't have a smell or taste which is nice. The color is rather sheer, and leaves behind little glitter flecks once it starts fading. The glitter eyeliner on the other hand is extremely dry, chunky and doesn't have a good base to work with. I was expecting a lot more pigment with a purple base, but I don't see how this can work without a good base to adhere to. 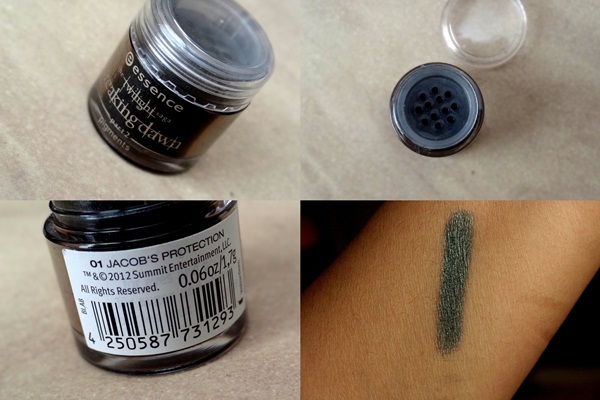 The Loose Pigments Eye Shadow in Jacob's Protection is a fantastic color and great value for money. It is a duo chrome blue/grey with tiny flecks of shimmer. It is easy to work with, very blendable and perfect for a dark, smokey eye. There is a slight blue shift that is visible under certain lights, but otherwise it looks more green and the quality is quite nice too. Overall, the Loose Pigments Eye Shadow is the only stand out piece that I really like and would say is worth getting. The lipstick is fine, but I've seen better from Essence. Save yourself a couple of bucks if you plan to get the glitter eyeliner though. What are your thoughts on the essence The Twilight Saga: Breaking Dawn - Part 2 collection? The Glitter Eyeliner is a dud, I wish there was a little more color in there. The pigment is nice though!